Ahead of today’s second practice session, the air temperature is 20.9 degrees C, while the track temperature is 34 degrees. It remains overcast, with a 40% chance of rain. In FP1, the leading three – Max Verstappen, Sebastian Vettel and Lewis Hamilton – were covered by just 0.096, while the Haas duo were ‘best of the rest’ behind Ricciardo, Raikkonen and Bottas. While there were a few offs and plenty of lock-ups there were on incidents of note. Having handed their cars over to their teams’ reserve drivers, Fernando Alonso, Sergio Perez and Marcus Ericsson are all in action this afternoon. As previously mentioned, following a change of turbocharger Ricciardo has a 5-place grid penalty, while Ferrari has brought back the updates that actually had a detrimental effect in the races that followed their introduction in Singapore. That said, after this morning’s trials the team has reverted to the old floor. At the same time, Mercedes ran back-to-back tests with a new rear wing the team has brought here. In the moments before the green light, Verstappen’s car is up on its stand with lots of bits missing and seven or eight mechanics working on it. Raikkonen is first out, the Finn running the medium tyre that was only run by Ricciardo and Vandoorne in FP1. Sirotkin, Hulkenberg, Vandoorne and Sainz head out, along with Alonso, the German and Spaniard, like Raikkonen, on the medium rubber. Raikkonen posts 10.587 to get the session underway as Christian Horner reveals that Verstappen suffered an oil leak which will “hopefully” cost him just “half-an-hour” of running. Grosjean goes second (10.954), ahead of Magnussen, Sainz, Vandoorne, Sirotkin and Hulkenberg. Vettel’s first flying lap – on the softs – sees the German go quickest with a 9.990. Vandoorne is advised that the wind has “picked up since FP1”. “Check the car, it’s pulling to the right on the straight,” warns Vettel. Ricciardo (softs) goes quickest with a 9.897 but is immediately eclipsed by Bottas who posts 9.668. Moment later Vettel posts 9.565. The session is red-flagged after Hulkenberg goes off exiting the final corner on the run up the hill and loses it on the damp grass and heads into the barriers. Replay shows the German ran wide, with his two right-side wheels going on to the grass… which was all it took. Asked if he is OK, he replies, understandably dejected, “Yeh, I’m OK”. Interestingly, Hulkenberg and his teammate were repeatedly going wide at that corner in FP1. The session resumes, and shortly after Leclerc gets proceedings underway. Meanwhile… Hamilton goes second with a 9.662 and Bottas third with a 9.668. The Briton on softs and the Finn on mediums. Raikkonen switches to supersofts, as he begins a qualifying simulation. Despite a minor lock-up and another error at T12, the Finn goes quickest with a 9.508. It was a poor final sector that cost him. As Hamilton goes quickest on his softs (9.245), unable to improve Raikkonen admits: “I don’t know what the **** is happening”. Now Vettel and Bottas switch to the supers, as do the Haas duo and Stroll. “I was three-tenth up, then I clicked the wrong button,” admits Hartley. Bottas goes quickest in S1, but aborts the lap following a mistake at T7. Moments later, Vettel follows suit after making a mistake even earlier in his lap. Quickest in the final sectors, Vettel raises the bar with an 8.919. 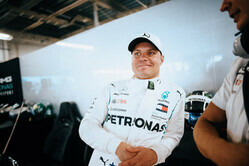 Moments later, Bottas responds with an 8.846 despite only being quickest in the final sector. “Massive understeer for some reason,” warns Magnussen, the Dane subsequently revealing that it was fine at the beginning of the lap and then got worse. Ricciardo, on his qualifying sim, goes quickest in S2, finally crossing the line at 9.164 to go third. The Red Bull clearly losing out in terms of sheer grunt up the hill. As in FP1, the Haas pair are best of the rest, ahead of Leclerc. With 52 minutes remaining, Hamilton switches to the supersofts as Leclerc splits the Haas pair with a 9.943. The world champion goes quickest in S1, as Grosjean admits “that was messy”, despite improving to 9.769. Quickest again in S2, Hamilton goes second with an 8.849 – just 0.003s down on his teammate – having lost out in S2. With 432 minutes remaining, Verstappen finally emerges, his Red Bull shod with the yellow-banded softs. Alonso improves to tenth with a 10.332, but is demoted when Verstappen posts 9.847 to go seventh. Now, it’s Ricciardo’s car which is the centre of attention in the Red Bull garage. However, reading the body language it doesn’t appear to be anything serious. With most of the drivers now having completed their qualifying sims, attention switches to the race simulations. Feeling he’s lost time behind “the ******* Mercedes“, Raikkonen will need to put a few coins in the Ferrari swear box when he pits. Sainz is warned there could be some “drops of rain at the exit to T12”. “Small drops of rain,” advises Magnussen. “Yes, but they are really tiny and they should be gone quite soon,” he is told. Verstappen switches to the supersofts and subsequently begins his qualifying sim. He posts a PB in S1, and another in S2. At the line the Dutchman posts 9.339 to go fifth, losing pace due to an unnecessary ‘battle’ with Stroll. “I was massively compromised,” he claims. Ricciardo is told that after 10 laps Vettel posts 13.0, while after 8 laps Hamilton posted 13.2. Prior to being told to pit, Vettel reported an issue with his right-rear not left-rear. Replay shows that the right-rear, when removed, did indeed have some nasty blisters running down the middle. “Is there a lot of gusts of wind,” asks Ocon. “Yes,” is the response. “What’s happening,” asks Vandoorne as he pits. “We have a problem,” the Belgian is told. At the other end of the timesheets, understandably, Hulkenberg is last, with Hartley 19th, Stroll 18th and Vandoorne 17th, each significantly off the pace of their teammate. Finally, Perez does his qualifying sim, the Mexican going 11th with a 10.320, just 0.15s off his teammate’s pace. A disagreement between Hamilton and his engineer Pete Bonnington. While the Briton wants to stop for changes to his car, he is told that his stop is not for changes other than the tyres. “You should be prepared for everything,” says the world champion. Sainz and Grosjean get close and very personal in the Senna Esses as they battle for track position. The Frenchman isn’t impressed. “No comment,” he says. Shortly after, at the same point, Bottas does well not to trip up over Perez. “My mirror has come off,” reports Magnussen. On the longer runs on the supersofts, over 10 laps Ricciardo averaged 13.1s, Verstappen averaged 12.8 over 5 laps, Hamilton 12s over 5 laps and Vettel 12.9 over 14 laps. “The fronts are very poor, I can’t turn,” reports Verstappen. Bottas is quickest, ahead of Hamilton, Vettel, Ricciardo, Verstappen, Raikkonen, Grosjean, Leclerc, Magnussen and Ocon. Perez is eleventh, ahead of Gasly, Alonso, Sainz, Ericsson, Sirotkin, Vandoorne, Stroll, Hartley and Hulkenberg.